Happy Summertime!! I’m sorry this isn’t a recipe but these shoes had to be shared! A few weeks ago it was my boyfriends sister, Meryah’s, birthday. 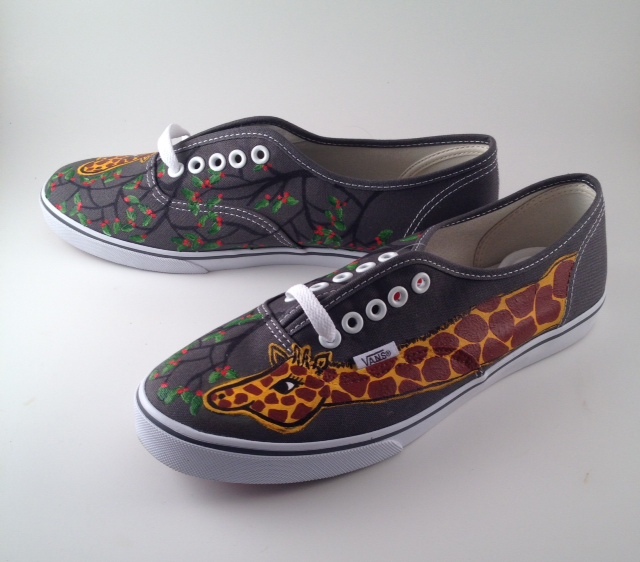 About a week before her birthday I found shoes similar to these on Etsy and thought they were PERFECT for Meryah because of her love for giraffes. The price tag however told me this was not the perfect gift for her haha. I was not about to spend $180 for a pair of sneakers, even if they were really cool. So instead, I decided to buy a pair of Vans and paint them myself. The only problem that came up was that there was no way this project was going to be done in a week with how busy my schedule was. So two weeks after her birthday she finally got her gift and fell in love 🙂 I have some steps below on how I made these shoes. Seriously, they were probably the best gift I have ever given just because of the work I put into them and how they were so personal. Gifts don’t have to be expensive, just get creative. There is so much more meaning when your own thoughtfulness and work are put into the gift. Happy Birthday Meryah!! First I started out with plain Vans shoes. This will work with any canvas shoe such as Tom’s or Converse as well. 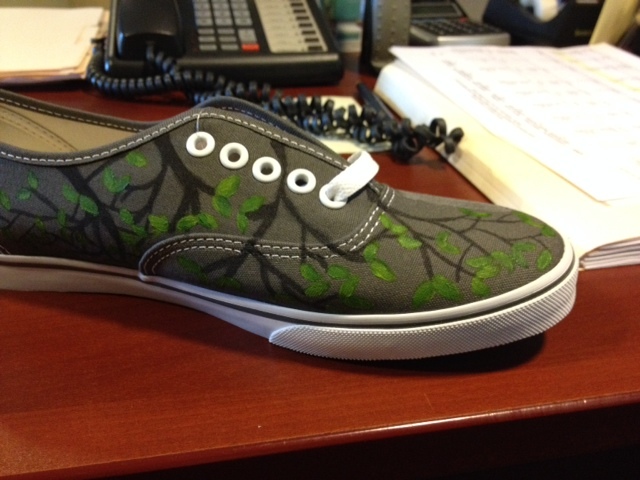 Without blowing my secret gift I found out that Meryah liked Vans over Tom’s so that’s why I went with these. If you are planning these as a gift, pray that you get the right size or find out if they have a similar pair already. Meryah is typically a size 9 in shoes but in Vans she is an 8.5 because they are supposed to be more snug. I was so thankful when she put them on and they fit! 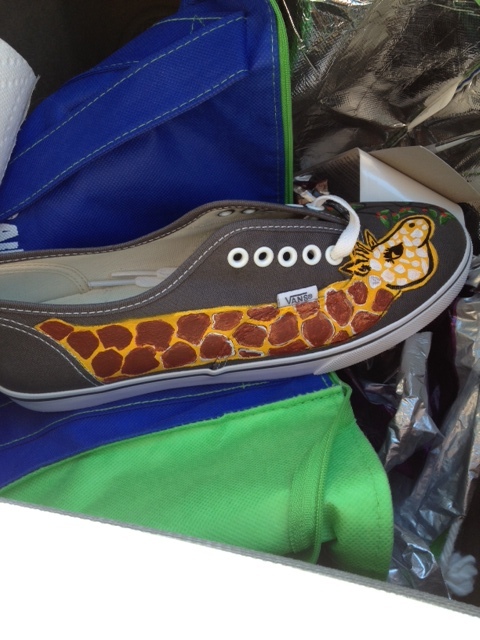 Once I had the shoes I found a few different giraffe pictures to work with and took a permanent marker and started drawing. It’s less stressful when you know you can paint over the shoes so if you mess up, it will be ok! Side note: Rubbing alcohol will also remove acrylic paint off canvas. When I first started paint the giraffe I didn’t like how it turned out and took a Q-tip with alcohol and removed the work I had done. It was a relief that this trick worked. Then I was able to start over on the canvas again. For the outlines and the tree branches you can use any kind of permanent marker or waterproof acrylic marker. For the giraffe base, I painted a layer of Gesso, but I think simple white acrylic paint would have been cheaper and done a better job. Luckily, I have a bunch of artist friends to give me tips and tricks along the way like this one. The white paint as a base layer really helps the whole piece stand out more against the darker canvas shoe. For the paint I used Basic acrylics with firm, nylon small brushes and for the black outlines I used a sharpie permanent marker. The acrylics are waterproof so once they are dry, she should have no problem wearing them out and about. The picture above was when I was almost done but you can see even after I painted the yellow base layer, I continued to paint on the giraffe with a white layer first and then the brown spots. The finished product! When all the paint was dry, I did a final finish with a Matte sealer to be extra confident to wear these in any kind of weather. I gave her the whole can of sealant as well so she can apply it again as needed. If you have any questions about the shoes, don’t hesitate to contact me! I absolutely LOVE it! 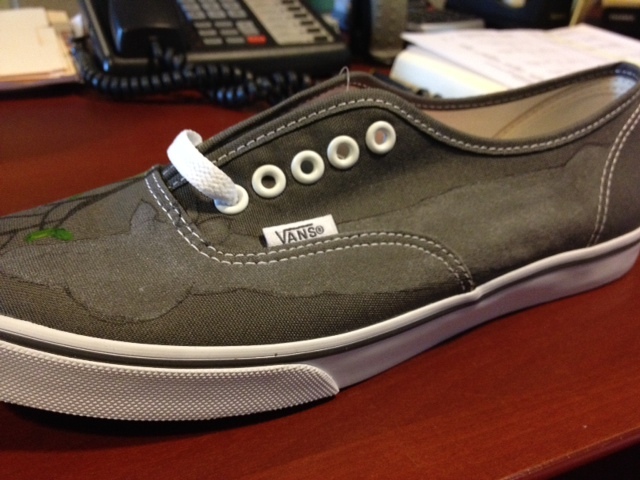 I’ve been wanting to spruce up my plain, grey vans! Although I did add glittery laces…adding some art would be even better! Nice job! Thanks! I want my own pair now too! You could also add glitter on top of the acrylic as well and it would stick good too 🙂 Let me know how they turn out! Welcome to my crazy, busy, life filled with nutrition and fitness. I have been in the nutrition field for ten years (what?! when did that happen?? ), a level 1 certified CrossFit trainer for three years and allergic to gluten...forever. I provide nutrition consulting to interested clients but my full time job is a dietitian for a school district in Pennsylvania. Thanks for stopping by!